Paul Rodriguez and the Nike SB team headed to Barcelona to officially introduce the Paul Rodriguez V in style. Paul Rodriguez is easily one of the biggest names in the world of skateboarding. Repping Nike SB for several years now, Paul and the Nike SB team recently headed to Barcelona to officially introduce his fifth signature shoe with the Swoosh. Inviting several friends from skateshops across the U.S, Skatepark of Tampa was lucky enough to join the trip and hit us with this video recap of another incredibly sick event put together by Nike SB. The trip included everyone being broken down into teams, each with a filmer, photographer and a local skate-spot guide to help the teams tear up the streets of Barcelona. Each team put together a three-minute video of their trip around the city, showcased later that night. 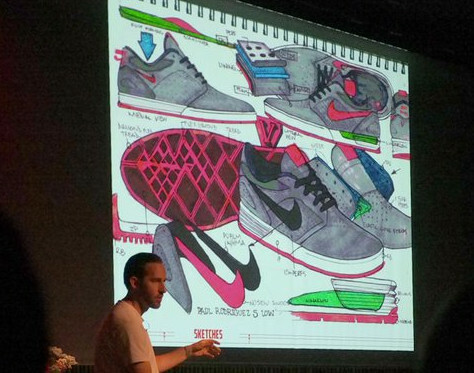 The special event also included a detailed presentation of the Paul Rodriguez 5, the opportunity to color-up a pair on NIKEiD, along with a ruckus performance by Raekwon to cap off the amazing weekend made possible by Nike SB. Enjoy SPoT's two videos below for a look at everything else that went down at the official launch of the Nike SB Paul Rodriguez V in Barcelona. Also, look for the Paul Rodriguez V to officially release stateside on August 8th at select Nike SB retailers. Barcelona for the Nike SB P-Rod V Launch from Skatepark of Tampa on Vimeo. Day Two in Barcelona: Beach Lurk, Shoe Nerding, and Raekwon Show from Skatepark of Tampa on Vimeo.